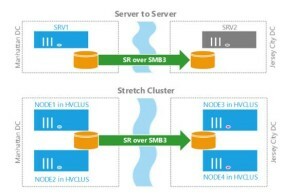 Storage Replica enables storage-agnostic, block-level, synchronous replication between clusters or servers for disaster recovery, as well as stretching of a failover cluster for high availability. Synchronous replication enables mirroring of data in physical sites with crash-consistent volumes ensuring zero data loss at the file system level. Asynchronous replication allows site extension beyond metropolitan ranges with the possibility of data loss. 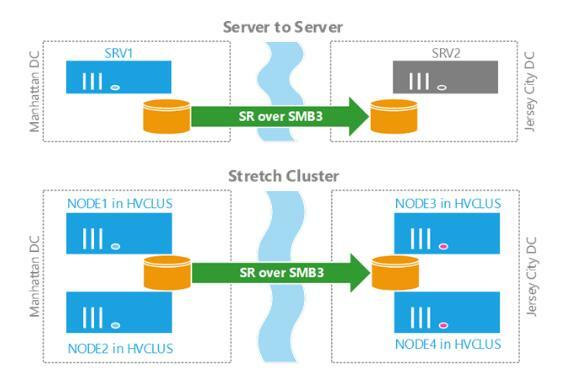 To help you get familiar with Storage Replica, we have a downloadable guide to provide you with step-by-step instructions for evaluating the Stretch Cluster and the Server-to-Server scenarios. These are both designed for Disaster Recovery and provide “over the river” synchronous metro replication.